Controlling selectivity, both stereo and chemo, represents one of the major challenges for organic chemists. 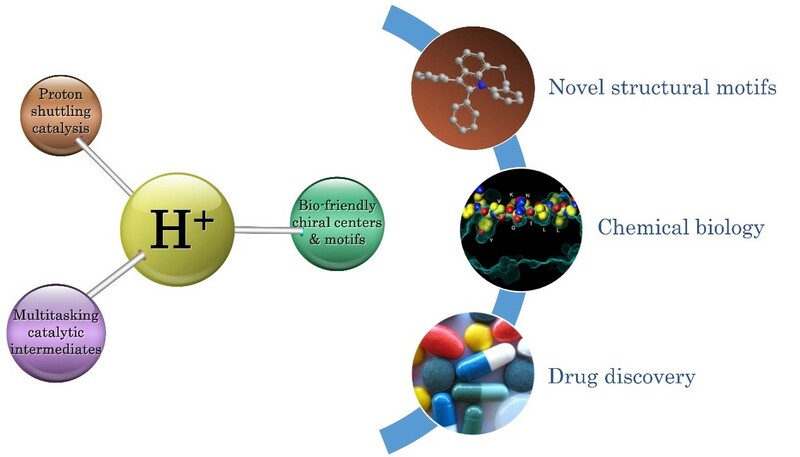 The Huang's group is focused on in-depth study of bioinspired proton-transfer process in organocatalysis that leads to discovery of novel modes of activation and asymmetric control, new catalytic species and highly efficient synthetic methods towards bio-friendly chiral centers and structural motifs of medicinal chemistry importance. Representative academic discoveries include: Chiral N-heterocyclic carbenes (NHC) as a non-covalent organocatalyst by a proton-shuttling strategy that extends the substrate scope of NHC catalysis beyond carbonyl compounds; Design and synthesis, using selective proton transfer as key strategy, of functional enamine/imine intermediates that possess unique nucleophilic, electrophilic, redox, cyclization and rearrangement reactivities via gold-amine synergistic catalysis. These studies and related directed catalytic reactions offer practical protocols towards various multi-substituted and chiral heterocyclic scaffolds. Our goal is to provide straightforward access to structurally versatile libraries that will find immediate application to natural product synthesis, medicinal chemistry and chemical biology. 1. Leifeng Wang, Fengjin Wu, Jiean Chen, David A. Nicewicz*, Yong Huang* “Visible-Light-Mediated [4+2] Cycloaddition of Styrenes: Synthesis of Tetralin Derivatives” Angew. Chem. Int. Ed. 2017, 56, 6896. 2. Jiean Chen, Pengfei Yuan, Leming Wang, Yong Huang* “Enantioselective β-Protonation of Enals via a Shuttling Strategy” J. Am. Chem. Soc. 2017, 139, 7045. 3. 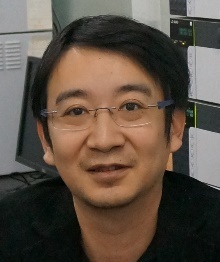 Hao Jiang, Li-Ping Xu, Yan Fang, Zhen-Xing Zhang, Zhen Yang,* Yong Huang* “A Migratory Ether Formation Route to Medium-Sized Sugar Mimetics” Angew. Chem. Int. Ed. 2016, 55, 14340. 4. Leming Wang, Jiean Chen, Yong Huang* “Highly Enantioselective Aza-Michael Reaction between Alkyl Amines and β-Trifluoromethyl β-Aryl Nitroolefins” Angew. Chem. Int. Ed. 2015, 54, 15414. 5. Chaosheng Luo, Zhen Wang, Yong Huang* “Asymmetric Intramolecular a-Cyclopropanation of Aldehydes Using a Donor/Acceptor Carbene Mimetic” Nat. Commun. 2015, 6, 10041. 6. Xijian Li, Siyu Peng, Li Li, Yong Huang* “Synthesis of tetrasubstituted 1-silyloxy-3-aminobutadienes and chemistry beyond Diels–Alder reactions” Nat. Commun. 2015, 6, 6913. 7. Zhaofeng Wang, Li Li, Yong Huang* “A General Synthesis of Ynones from Aldehydes via Oxidative C–C bond Cleavage under Aerobic Conditions” J. Am. Chem. Soc. 2014, 136, 12233. 8. Ying Chen, Dongqi Wang, Pingping Duan, Rong Ben, Lu Dai, Xiaoru Shao, Mei Hong, Jing Zhao*, Yong Huang* “A multitasking functional group leads to structural diversity using designer C–H activation reaction cascades” Nat. Commun. 2014, 5, 5610. 9. Jiean Chen, Yong Huang* “Asymmetric Catalysis with N-Heterocyclic Carbenes as Non-Covalent Chiral Templates” Nat. Commun. 2014, 5, 3437. 10. Zhaofeng Wang, Xijian Li, Yong Huang* “Direct α-Vinylidenation of Aldehydes and Subsequent Cascade: Gold and Amine Catalysts Work Synergistically” Angew. Chem. Int. Ed. 2013, 52, 14219. 11. Chaosheng Luo, Yong Huang* “A Highly Diastereo- and Enantioselective Synthesis of Tetrahydroquinolines: Quaternary Stereogenic Center Inversion and Functionalization” J. Am. Chem. Soc. 2013, 135, 8193. 12. Chengming Wang, Huan Sun, Yan Fang, Yong Huang* “General and Efficient Synthesis of Indoles through Triazene-Directed C–H Annulation” Angew. Chem. Int. Ed. 2013, 52, 5795. 13. Chengming Wang, Hu Chen, Zhaofeng Wang, Jiean Chen, Yong Huang* “Rhodium(III)-Catalyzed CH Activation of Arenes Using a Versatile and Removable Triazene Directing Group” Angew. Chem. Int. Ed. 2012, 51, 7242.